Farming Foible, or an Agrarian Adventure? : Don't hate. My dad called me as I was headed out the door for work to tell me that there were calves in the neighbor's yard and I needed to check the fences. Sadly, this isn't an entirely unusual occurrence. You see, the same fluff that makes calves so freaking adorable also insulates them pretty well against the zapping power of the electric fence. It has to be pretty dang hot to keep those bouncing bundles of joy contained and safe from the dangers of the blacktop. 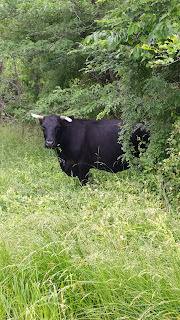 And also keep our neighbors happy, because even though I think calves gamboling around in my flower garden would be the most perfect photo op ever; it isn't everyone's cup of tea. There's no accounting for taste, ya'll. 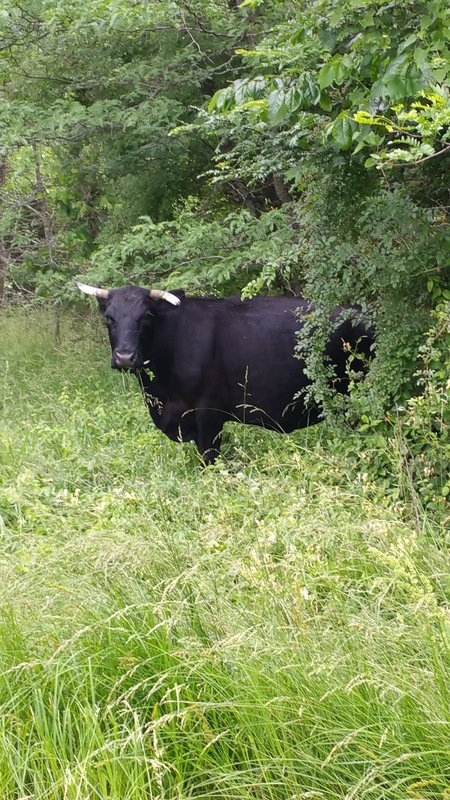 So anyway, I had a lovely morning playing farmer, fixing fences, and attempting to find all of the cows as they happily munched their way around five acres of two foot tall grass. While it is true that cows will "bunch" around a feeder, when they are grazing they spread out man. Regardless, I think they're all there, but a herd of all black cows moving around where you can barely see them makes it hard to be sure. The IL farm doesn't ear tag anyone so it is hard to know if they've been counted or not when I can't see their faces to know who they are. I got the fence hot, and rigged it in a few places because I didn't have the tools with me to fix it permanently. That's going to be tomorrow morning's project. Dad has promised to teach me how to restring a broken high tinsel (really heavy duty steel wire that doesn't work like the light duty wire I am used to) section. Now here is where things divulge from farm life to my personal beliefs, so if you don't really care about that then I encourage you to take this cow picture and go with my blessing, or file this one under knowing your farmer. Either way. After I finished up with my farming for the morning I made a decision. A decision that I knew would have some repercussions, namely that it would make feeding later a bit of a difficulty. A decision that I don't regret in the least. I decided to wear a maxi dress and jacket, and I believe that EVERY person other than Captain America had something to say about it. Please note that I still hadn't done my hair, or worn make up, and this thing was like the yoga pant of the dress world. What I did not anticipate was the barrage of questions: "Why are you so dressed up?" "Who died?" "That jacket doesn't go with that." "You can't work in that." "You're overdressed for feeding aren't you?" This and comments like them, from at least eleven people. My inner monologue had a field day. "Because I wanted to mess with your world view." "I'm actually my own evil twin." "I wanted to spend all day defending my clothing choices." "It was hot." "It was easier than trying to find a clean pair of jeans," as most of mine have some sort of marking on them whether it is a stain from the cows or from farm equipment repair. "I just got the dress and I delight in it." "I just wanted to?" "It is coral, so I probably wouldn't wear it to a funeral." "Overdressed? Pioneer women pulled plows in dresses, you know." The list goes on and on, but it raises the question, why do I have to defend my choices? I just wrote about my realization that I was a farmer, and you know nine times out of ten I dress like one, but I am also a grown woman who likes to wear something that flows around my ankles when I walk every so often. So what if I have to hike it up and tuck in in my bra to make it a mini and keep it from getting puppy prints on it? That's my prerogative. I guess what I am trying to say is this: when did it become our job to judge one another, and not just delight in each other and the unique qualities that we each bring to the table? I think that goes far beyond clothing choices too. I am PASSIONATE about what I do, and how I think that livestock should be raised; but I have to appreciate what other farmers do and why they make the choices that they make when it comes to their life and livelihood. Grassfed beef, free range chickens, and organic gardening are clear choices for me, but I don't have to bring anyone else down to bolster that belief. I'm not sure all other farmers could rock a coral maxi/mini dress and muck boots, but I can; and similarly to my beliefs about the food industry and animal husbandry I respectfully refuse to apologize and make excuses for that, even while acknowledging that it isn't for everyone. Now, if you don't mind, I am going to go spin circles in my flowy skirt to Taylor Swift's "Shake it off" and see if the cows try to eat it. I think I'm just a farmer.